Since being married, there’s two things I miss a lot – the oven at my mom’s place and my cat Chad. I live for the oven. A decent oven placed strategically makes cooking and baking a lot easier. It’s the star of the show when you’re preparing a few dishes on the stove – make something wonderful and stash it in the oven, time it and come back when it’s ready and voila! A meal or dessert done. I always had a stash of cafe-style muffins in the fridge back when I was living with my mum. My mum, being obsessed over bananas, used to have plenty of overripe bananas which I forbade her to throw out. Mash them up, save it in the fridge or freezer, then chuck in into your chocolate muffin or chocolate cake batter. Ahh life’s simple pleasures, me thinks. If there’s one thing I’m navigating through married life is that I’ve had to restart the process of making myself comfortable. You see, I was set on living a life at my mum’s place till I can afford and am eligible to get my own place (that’s when I hit 35 years old as a single woman). Then one day cupid came and I got myself married to a lovely man, and hey, I’m not complaining! It’s difficult sometimes, but what is marriage without troubles, am I right? I do miss the kitchen I built with my mum, but in the mean time, allow me to scroll through Pinterest and plan our new house way in advance. I was looking through my Instagram one day and I realised it’s been a long time since I baked muffins (also, I miss having a stand mixer ready and waiting on the kitchen countertop to be used). I remember bringing them to class one day, and my classmates went crazy. I remember bringing them to work and my colleagues hating me for spoiling their diet. And now, I have a memory of feeding them to Faeez so he won’t want to spend $5 at a cafe for a muffin I make at home. Anyhoos, the secret to delicious chocolate muffins is in the cocoa. I only have Valhorna cocoa powder stocked in my pantry, and if I do run low on them and can’t swing by my go to place to get them, Ghirardelli chocolate cocoa powder from NTUC works perfectly fine. In a mixing bowl, add butter and sugar. Beat until sugar granules have dissolved and mixture is a pale yellow. Add vanilla and yoghurt then beat using a wooden spoon until incorporated. Add in all the dry ingredients and fold in to make sure the batter is well combined. Add in chocolate chunks or chocolate chips, then fold in to evenly distribute the chocolate to the batter. Using a muffin tray, line tray with muffin liners. Spoon batter into liners. Bake for 20 minutes, or until a cake skewer comes out clean. If you have a sweet basil plant growing ridiculously out of control somewhere on your corridor, the easiest way to preserve all that precious delicate basil leaves is to make a pesto sauce out of it. And no, pasta isn’t the only thing you can make with that pesto sauce. One of my favourite dishes to make with the pesto sauce is actually pizza. It’s unconventional, but trust me, it’ll make your home made pizza experience a mind blowing one. You could use store bought pizza crust, or simply a loaf of bread lying around somewhere in your pantry waiting to be used. No one is judging you for using store bought stuff! We’re not The Pioneer Woman raising cattle on a farm with no convenience store within 2km. But if you do decide to spend some time making handmade pizza dough, this recipe adapted from Laura Vitale is my go-to recipe. Again, don’t feel pressured to make your pesto from scratch. Jamie Oliver’s pesto sauce is the best alternative to a freshly made pesto. In a mixing bowl, add yeast, sugar and water. Mix lightly with a fork and set aside for 10 to 15 mins to allow the yeast to activate. Add flour and knead until it comes together slightly. Add in olive oil and salt, and continue kneading until everything comes together. Using a dough attachment, knead using a standing food mixer for about 15 minutes on medium. Alternatively, you can hand knead for about 20 to 30 minutes. Form dough into a ball, then place it in an oiled mixing bowl before covering using a plastic wrap or cloth. Let the dough rest for 1 hour. In the mean time, you can prepare your pesto sauce. After an hour, divide the dough into 2, and shape into a ball before rolling the dough out into 8 inch rounds. Cover with the used plastic wrap or cloth, and let rest for 15 minutes. Assemble the pizza by slathering the pesto sauce onto the pizza base and adding cheese of your choice. You could use vegan cheese to make this pizza entirely vegan. Bake in oven for 10 to 15 minutes, until the crust is browned and cooked. Serve with fresh arugula which has been rinsed and dried with a kitchen towel to remove excess water. In a food processor, add all ingredients and pulse. Blend until all the ingredients are fine and well combined. Keep in a jar and seal the pesto with a layer of extra virgin olive oil, or freeze into cubes for easy access to cooking. 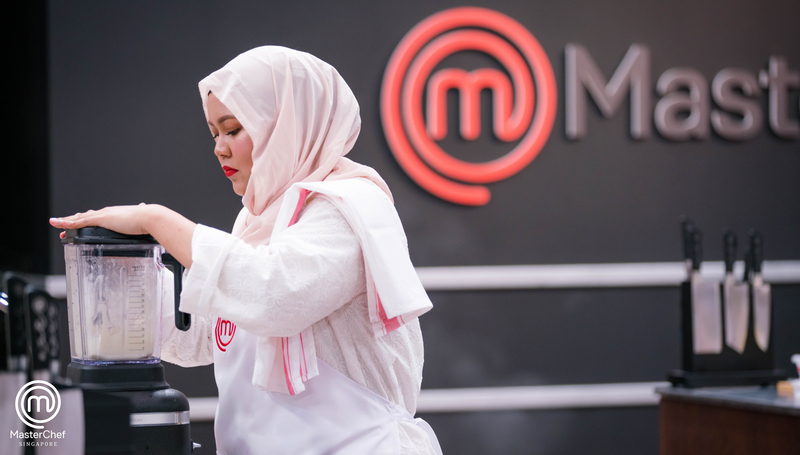 It’s been a month since the season finale of Masterchef Singapore, and the start of a crazy end of the year. You see, prior to Masterchef Singapore, I was just a photographer specialising in weddings, portraits and food. My previous job started off with me doing a lot of cooking, but ended up with me doing a lot of eating instead. When I left after 4 years, I was lost and confused because I know I wanted food to be a part of my life, a part of who I am, and do it professionally somehow. Food has always been my escape – both positively and negatively. I could delve deeper but I think that warrants another post. Dealing with the major problem I had with food made me love creating flavours and foods that were both appealing to the eye and delicious to the taste. More importantly though, I felt the need to immortalize my mother’s recipes, and any other makcik around me for that matter. Since Masterchef Singapore, though, life has been a lot more interesting. Having little kids and makciks asking for a photo while I’m working has humbled me a lot. For one, I have these little kids looking up to me, and then I have a group of makciks who have years of experience in the kitchen complimenting me on my cooking. I’m far from being a chef, truly. All I do is make a mess in the kitchen and eat because the desire to eat is after all more than the desire to cook. I just want to make sure what goes in my mouth is what I would serve others. I grew up not seeing my mother bring a cookbook, let alone an iPad, into the kitchen. There was a brief moment where she was baking a lot, and that legendary baking book (lemme find the title!!) was always by her side whenever she was making Kek Lapis. 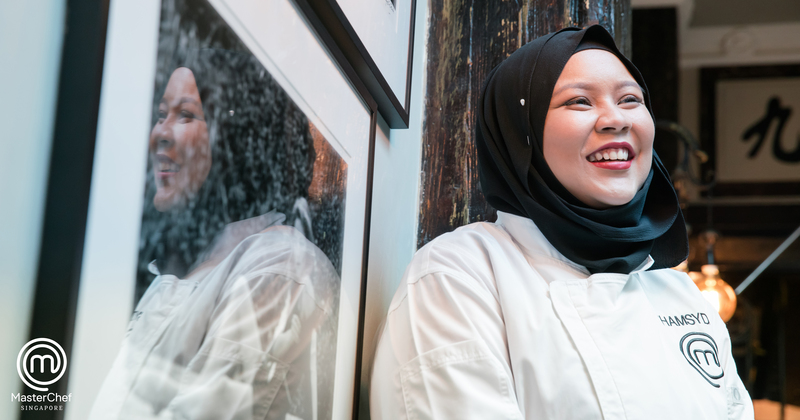 Each year during Hari Raya, I would see her whip up five or 6 dishes for a whole day straight. Mind you, she never lets me in the kitchen to help! On the other hand, I have a sister who cooks amazingly and swears by the recipes she finds from cookbooks, blogs, websites and other makciks. I reckon it’s her science background that makes it easy for her to follow instructions and ace the experiment. And then you have me – the resident Perangai Budak Gemok who just wants to eat good food and makes sure she’s able to replicate foods she’s tasted from other countries, homes or restaurants. It’s frustrating to eat out with me, because if either my mum, my sis or I am able to cook it at home, it’s not worth my money. So anyways, I’ve been living away from my mum since getting married, and I do miss her cooking. On some days, my mum would randomly be making Ayam Penyet based on a recipe she found on YouTube (her new found love) or kneading away making this favourite of mine – Roti Boyan. 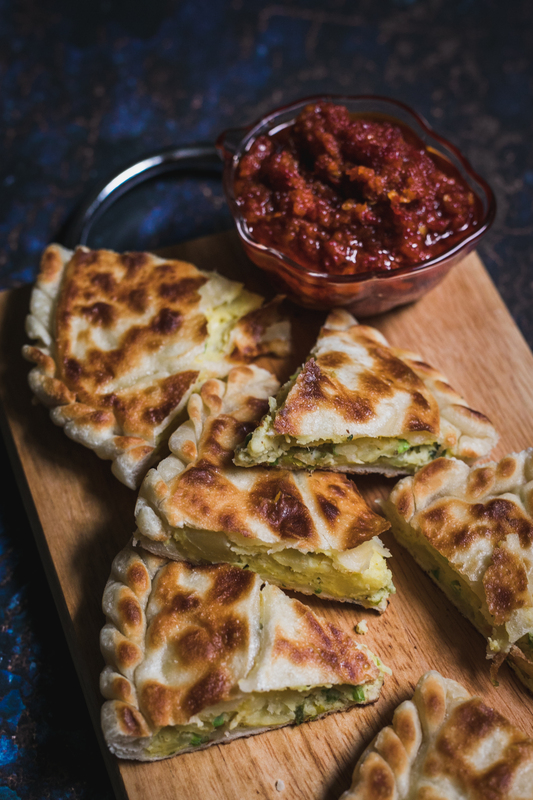 It’s basically a prata-like dough (with much less oil) with a filling of potatoes, eggs and onions. There’s many versions of it out there, but I do prefer Ibu’s Roti Boyan because she doesn’t deep fry it. All hell will break loose if I do that and serve it to her calling it Roti Boyan. Being away from my mother also means being away from almost all of my kitchen gadgets and equipments which I’ve collected over the many years living with her. My trusted standing mixer is now away from me, which means I have to manually knead dough by hand whenever I feel like making bread, or using the hand mixer when I’m making cookies or bakes. The good thing about this is that I’m able to know for sure when the dough is ready, or when I can stop kneading and let the dough proof. Needless to say, my fear of making bread by hand is no longer there! When I called Ibu asking for the recipe, she did the usual “Agak-agak je lah…” so naturally I had to be extra cautious and actually measure out the ingredients so that my future kids will not have a problem when they ask me for the recipe instead. In a big bowl, combine flour and salt together. Add water, 2 tablespoons at a time, and knead the dough until it comes together. Continue kneading until the dough is sticky to touch. Do not be alarmed if it’s too sticky. Add butter, and continue kneading until butter is well incorporated. Add a bit more flour if the dough is too sticky, but ensure that dough stays soft through out the entire kneading process. Form dough into a ball, then leave in the bowl covered with a cloth for an hour to rest. Drain potatoes and put them back in the same pot used to boil. In a separate bowl, crack eggs and beat till fluffy and well combined. Mash potatoes, add in eggs, parsley, spring onions, salt and pepper. Mix until well combined. Divide the dough into 10 equal pieces. You may weigh them if you prefer accuracy. Just eyeball the sizes if you’re lazy like me. Place the balls of dough on tray and keep them covered with the cloth while you are working on one. Prepare 2 serving plates about the size of your palm. Oil them with vegetable oil just enough to cover the entire plate. On your countertop, dust the surface with flour. Roll out a piece of dough to the size of the serving plates. Make sure to keep turning the dough when you roll it out so it doesn’t stick. Place the first piece of dough on the oiled serving plate. Stretch it out as much as possible so it comes to fit the plate. Add a ladle of the filling to the centre of the dough. Go back to your countertop and roll out a second piece of dough. Carefully place the second layer of dough on top of the filling. Press the sides so they stick together. Crimp the sides of the pie like epok-epok. Repeat and continue the process for the remaining dough and filling. Heat a non-stick pan on the stove with a teaspoon of oil at medium heat. Slowly slide the pie onto the pan and cook for 3 minutes. Flip the pie and cook for another 3 minutes. If you wish to freeze and keep the pies, this is where you remove it from the pan and let it cool before freezing. If you wish to serve it immediately, continue cooking each side for another 5 minutes on low heat, or until the crust comes to a nice deep brown colour to it. Married life has been great, alhamdulillah, and I’ve had a free weekend last week. God knows how precious free weekends are for me, especially since I’m always working on weekends. Between trying to squeeze time for dates with F and whipping up something in the kitchen, I can’t imagine how life would be like with kids in the future. For now, I’m happy with my newlywed life. I received a PR kit from Kang Kang noodles, which featured some of my usual favourites like the kway teow and hokkien mee as well as some of the products from their new wholewheat range. Blasphemy, I know, but I wanted to give this wholewheat range of noodles a chance, just like how I gave wholewheat pasta a chance many years ago. My imaginary Italian nona would be rolling her eyes to the heavens above, I’m pretty sure. But hey, change is good. So I have to give these new products a chance. Baksa is traditionally an Indonesian beef broth noodles served with meatballs. The meatballs are usually dense, salty and filled with delicious MSG flavour. I know the world is divided on this magic powder called MSG, but for me, I eat whatever is served on my plate. I don’t add this magic powder to my own cooking. So since I didn’t want that dense beef balls, I had to resort on making my own. Think of this bakso as Swedish meatballs meets chicken soup. Not exactly the original bakso but this is of course, the Modern Malay Kitchen. Hehehe. Mix all the ingredients together until well combined. Roll out the meat into small balls and set aside in the fridge until ready to cook. In a medium sized pot, heat 2 tablespoons of oil. Add in minced onion and garlic, and saute for about 4 minutes. Add in spring onion and coriander leaves and ginger. Add in chicken stock and simmer for 15 minutes on low heat. In a separate pot, boil water for the meatballs and noodles. Add meatballs in the boiling water and cook for about 3 minutes. Remove from pot and set aside. Add noodles and cook for about 3 minutes till the noodles are separated. Drain and set aside till ready to serve. Heat a heavy bottom pan with oil enough to cover the base. When oil has heated up, pan fry the meatballs on high heat for about 2 minutes, until the outsides are browned. Serve while hot with garnishes. Tomorrow is a new day for me as I begin my journey as a wife and partner to F, my dear husband-to-be. The past ten months has been quite a blur, to be honest – a sudden proposal, a career change, and now an upgrade from the current relationship status. In all honesty, I never thought this day would come. A morose piece back in 2016 saw myself questioning my life, my career and aspirations. As I start a new day tomorrow as a wife, it’s time I revive this site and make my love for food another chance. 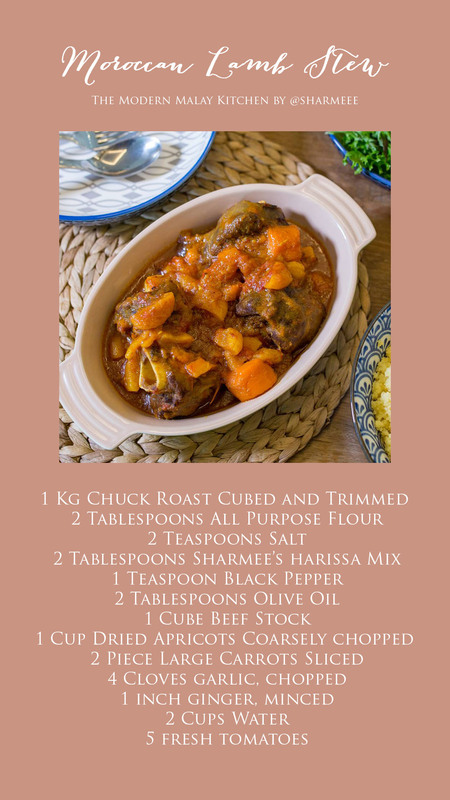 This Moroccan Lamb Stew is a personal favourite dish of mine. The guests to my wedding to F would be receiving the harissa mix as a favour, and of course the most practical wedding favour would be a spice mix for my guests to cook with! Cut me some slack with the video cos I haven’t been in front of the camera for a long time. Alternatively, feel free to save this recipe card and save it to your growing list of IG story recipe cards! Combine flour, salt and pepper on a plate and coat the beef pieces. Heat olive oil over medium heat in a Dutch oven and brown beef evenly in batches. Sprinkle harissa over the beef. Add the carrot, garlic, ginger, water and beef stock. Add tomatoes. Bring to a boil, reduce heat to low, cover and cook to 1 to 1 and a half hours. Add apricots and cook an additional 15 minutes on the stovetop. Meanwhile, boil 2 cups of water and mix with couscous. Stir couscous well and let the mixture sit until all the water is absorbed. Add in 2 tablespoons of butter and a pinch of salt and stir well. Serve with couscous and garnish with celery sprigs and serve with harissa. I have this bad habit of just cooking whatever I am craving for instead of buying it off from a shop somewhere, just like a normal person does. But you know what, it’s worth it and it has paid off because as tedious as it is to cook it on my own, there’s an immense sense of satisfaction when it gets in my tummy. Call me crazy, but trust me when I say there are other people worse than me. As of late, a few of my friends who just got their new homes or recently changed their status to being a wife or having to manage a household have requested that I share or teach them how to cook because I seem to make cooking so easy. Not forgetting the few friends who have personally requested that I live with them just so I can cook for them on a daily basis. I make a great Couchsurfer by the way cos I’d be willing to wake up early just to make a delicious breakfast for y’all. So for you guys who don’t follow me on Instagram, here’s my twist to Kway Teow Goreng. Nothing fancy, but really just enough to fulfil them cravings and keeping it at bay. Boil a kettle of water. Place kway teow noodles in a big bowl. Once water has come to a boil, pour the water over the kway teow and let it sit for about 3 minutes. Drain the water away and set aside. Heat about 5 tablespoons of oil in a wok on medium heat. Add in onion and fry for about 3 minutes. Add in ginger and garlic and fry for another 3 minutes. Add in chilli paste and continue frying until the spice mix is tempered for about 5-8 minutes. Add in chicken, let it cook for a further 5 minutes before adding the squid and fish cake. Add in the drained kway teow and oyster sauce, light soy sauce and kicap manis. Stir well. Add in chives. Serve with fried egg and limau kasturi. As a child, I used to love celebrating Eid. 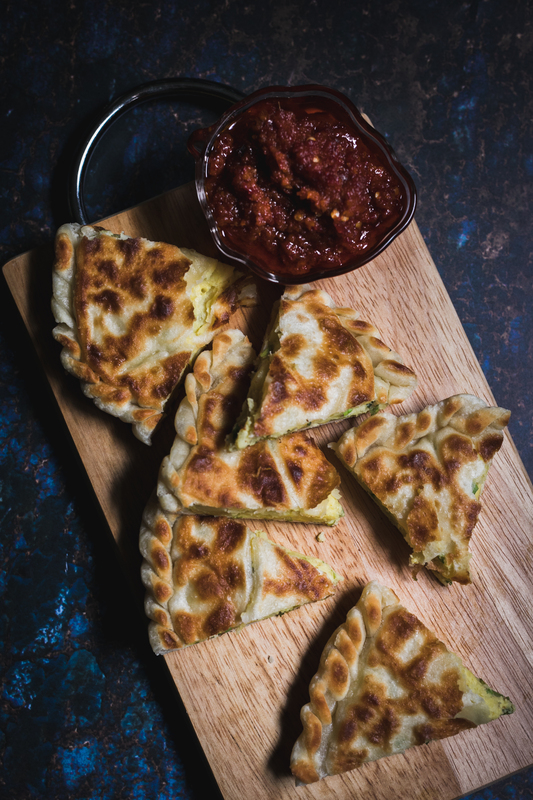 I dreaded the fasting month of Ramadhan but I looked forward to new clothes, eating scrumptious rendang and ketupat, and of course, for many Asian kids – the collection of green packets filled with dollar dollar bills. Apart from visiting close relatives on the first day of Eid, you get to spend another day in Syawal with your closest friends from school visiting their houses. It was kinda cool to bring your friends over when you were ten years old, dressed in the traditional baju kurung going around the neighbourhood and coming home at the end of the day with your bag bursting with green packets. You would know which house gave the envelope, and if you get at least $5 from that house, you’re definitely going back there again the year after. As I grew older, however, the enjoyment of Eid started to fade away. At fifteen, I despised celebrating Eidulfitri. Eidulftri would be torturous for me since I had to appeased my newly divorced parents – I couldn’t spend more than 2 hours at my dad’s place or I’ll never hear the end of my mum’s wrath. My sisters were busy with their own families, making sure they visit the in-laws before making their way to my mum’s. And for some reason, you start not liking your relatives. I remember bursting out at my sister for coming so late int the afternoon and my make up was already ruined from the frustration of waiting around. The first day of Eid as a hormonal teenager was basically me playing the waiting game. Eid started to change as I entered my twenties. While it was still as boring as when I was a teenager, I began to prepare the house the house willingly. I bought flowers, new cushion covers, and occasionally curtains to slowly make the house into a home. I volunteered help in the kitchen, making sure I picked up my mum’s recipes to her signature Eid dishes and perfecting them. I made cookies and sweet treats to offer to the guests coming over to my place and made sure there were all sorts of drinks available for them. As much as I wish Eid is better now as I enter my mid-twenties, I realised that an awkward Eid is a common predicament between peers of my age. Perhaps it’s the having to part with copious amounts of money during the festive period – spending for the house and family, green packets for the little ones, awkward conversations with aunts and uncles who seem to nitpick on every aspect of your life. Or maybe it has got to do with spending Eid as a single woman, wondering when you’d be able to prepare for Eid excitedly for your kids and husband. Whatever the reason is, Eid as a struggling single twenty something is just plain boring. I make do with baking cookies, cakes and occasionally help my mum prepare the traditional dishes we feast on the morning of Eid. House chores like literally scrubbing the floors get my mind off the fact that each Eid is the same as before – lonesome and boring. I try getting away from celebrating Eid by going to work, but I feel bad for my mum. Though to be honest, I’m quite happy working while everyone else celebrates. One day, I’ll wake up on the morning of Eid excited to head to the mosque, dress my family up and head out for the rounds of visiting. One day, I’ll learn to appreciate the merry-making and spamming of family photos on Facebook and Instagram. One day, I’ll teach my daughter how to prepare the raya dishes and get my son to wash the windows and fix the curtains up. One day, I’ll be on my knees on the morning of Eid, with my head buried in my husband’s hand, asking for forgiveness and perhaps shedding a tear or two. One day, that happy family portrait of mine will be hung on my wall just in time for Eid. For now, I’ll be contented with spending the morning of Eid at home, with a cup of coffee and a bowl of lontong, watching reruns of Bujang Lapok on the telly with my three cats.